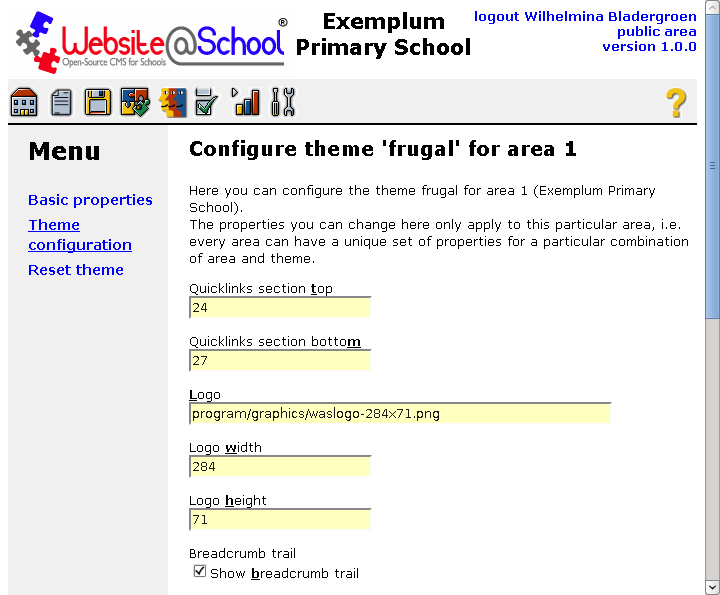 Frugal is the basic Website@School theme. For its features, please see paragraph 2.2 Theme configuration. In theme Frugal many options that apply to other themes are discussed. Tips are discussed in 3. The theme in practice:tips. Theme Frugal is a so-called responsive theme. That means that the layout of a page adapts to the available width of the physical screen. The default tipping points are 700 pixels wide and 1200 pixels wide. For screens with a width between 700 and 1200 pixels the Frugal theme looks as follows. The header of the theme takes about 20 percent of the screens top horizontal space. 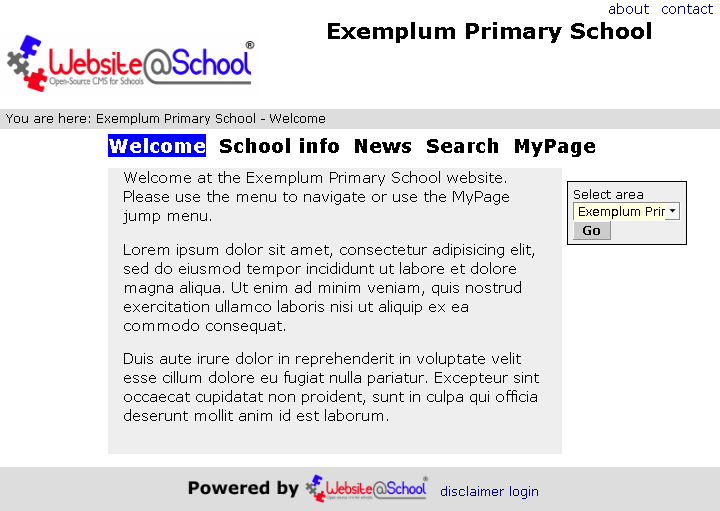 In the header area, on the left side is the Website@School logo, in the middle the Area title 'Exemplum Primary School' and, in the upper righthand corner, two top links 'about' and 'contact' are located. At the bottom of the header is the breadcrumb trail. Below the header are the menu, the content and the Area jumper dropdown menu. The menu takes about 20% of screen space and contains the section titles: 'Welcome', 'School Info', 'News', 'Search' and 'MyPage'. The content takes about 60 % of screen space and the Area jumper dropdown menu the remaining 20 %. The footer of the theme is a horizontal bar of about 5 percent of the screen height. In it are the centered Website@School logo, and to the right of the logo, the bottom links 'disclaimer' and 'login'. For screens smaller than 700 pixels, the layout changes as follows. 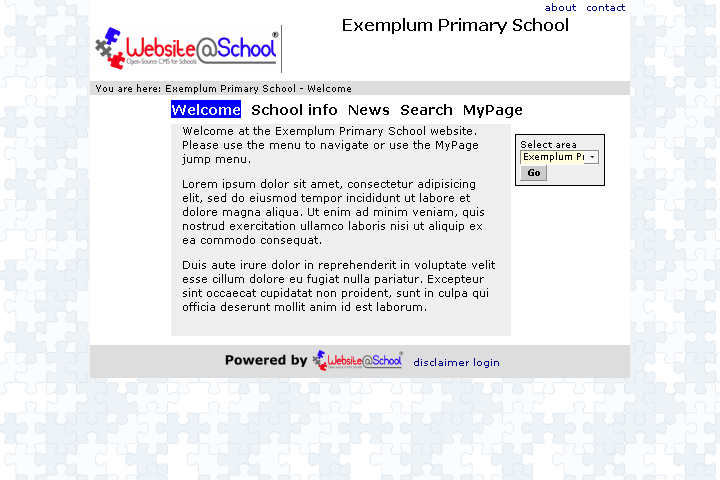 The page begins with the Website@School logo, followed by the the Area title 'Exemplum Primary School'. The main menu items ('Welcome', 'School Info', 'News', 'Search' and 'MyPage') have been replaced by a clickable blue rectangle with three horizontal lines. This icon is also known as a hamburger button. Clicking the menu button scrolls the page to the menu at the bottom of the page, see below. This menu button is followed by the actual content of the page and the Area jumper dropdown menu. The main menu is displayed near the bottom of the screen. The currently selected item is blue. If there is a submenu (not in the case of the screenshot above), it is displayed under the main menu. The currently selected submenu item is colored red. The page ends with the 'Powered by Website@School' link, followed by the links 'disclaimer' and 'login'. The basic idea of this design is to present the information from top to bottom rather than from left to right, in order to keep the content readable. Also, the content is presented near the top of the page as much as possible to prevent unnecessary vertical scrolling. Note that it is possible (via the blue 'hamburger button') to navigate to any page via the menus near the bottom of the page. The links at the top of the page ('about' and 'contact') have been sacrificed in order to create more space for the content. If these links are really important, you may want to move them to the links at the bottom (next to 'disclaimer' and 'login') because those links are always available. On a wide screen, with more than 1200 pixels, the page stops growing sideways. The width of the header, the menu, the content area and the footer is limited to 1200 pixels. The remaining space on the wide screen is shown as a grid of jigsaw pieces. This is done to limit the width of the lines to a length that is still readable, even on a wide screen. Quicklinks section top: Enter the section number that contains the top row of clickable links (about, contact). Default: 17. When entering 0 (zero) you have no quicklinks in the top of the theme. In the Page Manager, create a section with a descriptive name, for example quicklinks (top). Make the section invisible if you do not want the section name to appear in the section bar. Find the section number by hovering over the section name. Enter that section number in the themes top links entry field. Create the top link titles. The 'about' and 'contact' are in fact page names. All page properties, basic, advanced and content apply to the toplink pages. You can have as many toplinks as you want. From the CMS program folder, which is: program/graphics/waslogo-284x71.png. No leading slash! From CMS data folder with a proxy-friendly URL. Use the fileroot program as prefix for the path to the image, for example: /file.php/areas/grade8/basics_pupils_heads.png. Note that this is also the path to the image file as described in the Basic procedures for beginners, paragraph 3.3.3 Insert the image into the web page. From CMS data folder without a proxy-friendly URL. Use the fileroot program with the path to the image as a parameter, e.g. /file.php?file=areas/grade8/basics_pupils_heads.png. See section 4.1 Site configuration in chapter Configuration for more information about proxy-(un)friendly URLs. From an URL, for example: http://exemplum.eu/oldstuff/schools/school17.png. Logowidth: in pixels. Default: 284. The Width defines the width of the image. For 'normal' screens 1024 pixels is a good choice. For best results, make the picture the same size. Do not use a .bpm picture. Due to their size, it takes long to download. A better format is .png. Logoheight: in pixels. Default: 71. Breadcrumb trail [ ] Show breadcrumb trail: Check to have a breadcrumb trail in the theme. Default: checked. In this paragraph we discuss some particluar tips that apply to this theme. We assume you have read about the concept of Bazaar Style Style in the Viewpoints chapter, paragraph 3.1 Cascading Style Sheets. And we assume you have studied the practical side of BSS in the Configuration manager chapter, paragraph 3.4 Configure theme 'Theme Name' for area n.
To create images, chapter Theme Sophia, paragraph 3.2 Creating stencil files gives some hints when using free programs and how to create an image. In all themes almost anything in their style can easily be adapted with Bazaar Style Style. This includes, among many other style elements, several kinds of text input fields and their labels, all kinds of buttons, check boxes and radio buttons. For visually impaired website visitors this feature might be helpful to improve visibility in modules that require input from the visitor. For example the Mailpage , the Althing (weblog) and the Confab (chat) modules. The styling of a theme can be done in the Static stylesheet. For theme Frugal it's located at program/styles/base.css. 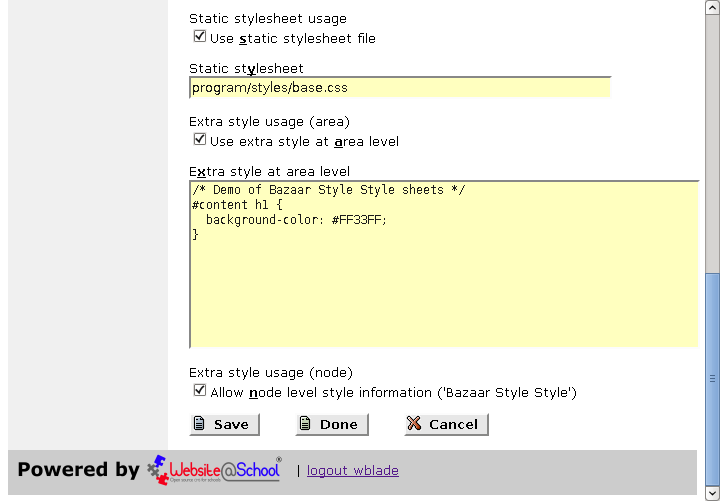 You can read the Frugal style.css file by pointing your browser at http://yourschool.org/program/styles/style.css. For all other themes, you find the style.css at http://yourschool.org/program/themes/<themename>/style.css. The hexadecimal color values in the code below, i.e. #RRGGBB, have to be adjusted to the schools taste. Below is the code for individual input fields. Currently it is unused. Below is the code for the buttons. 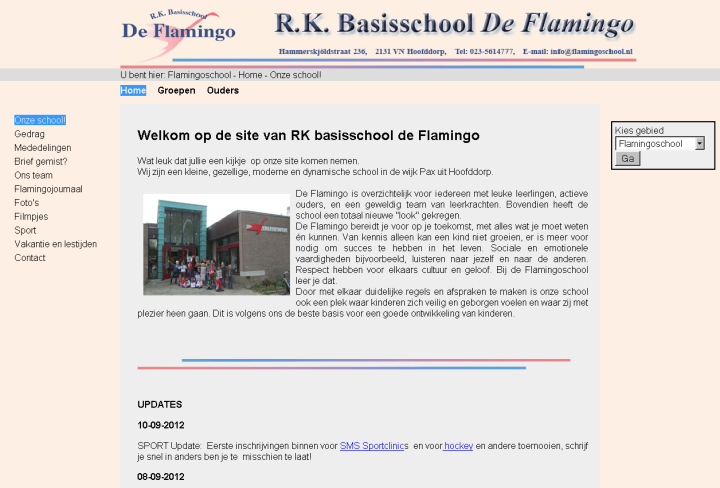 Below is the example to replace the Website@School logo with the one of your class. You can copy and paste it on the area of your class. Adjust the path and file name of the picture. Go: Configuration Manager > Areas > pencil (class area) > Theme configuration > Extra style at area level. NOTE: Keep the image the same size as the Website@School logo, i.e. 284x71 pixels. Or enlarge it. Experiment!